You your Valentine and you want to make sure they know it, right? Here’s the unique alternative to pimple-provoking chocolates and soon-wilted roses. 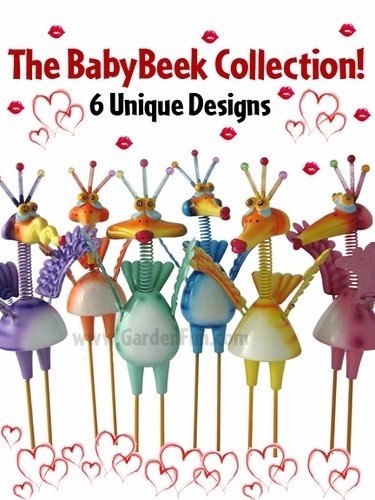 The BabyBeek Pucker-Up Collection says volumes about your creativity, love, and great sense of humor. Your wife, geek girl, friend, teacher, boss, grandma, or niece will smile every time they see the BabyBeek PuckerUps in their home, garden or office cubicle; in a flower pot or on a shelf. Each hand-painted Baby Beek Pucker-Up is 14" tall. Six different colors, and each has its own unique personality and face. No watering, no calories, no cavities, just a silly, fun way to tell all your Valentines "I You." We’ll include your personal message with your geeky Valentine’s Day love gift. Don’t worry, it can be sent anonymously. We’ll never tell who sent it. Geeky love birds are unique, creative, hand-painted Valentine’s gifts for your most romantic lover, or the geek girl or boy you and equally cool for co-workers, kids, teachers, family and friends. There’s a whole flock to choose from! Baby Beek Pucker Ups. No water, no calories, no cavities! BabyBeek Pucker Ups are the most thoughtful, romantic, funny, geeky, original Valentine’s Day gift ever. Each Geeky Beek and Baby Beek in the flock has a cast-resin head with its own unique face - hand-sculpted by artist Tim Twinkler. These adorable love birds are guaranteed to deliver an overwhelming supply of laughter and love, and whimsical fun! 14" BabyBeek Pucker-Ups, Cast-resin head, Metal wings, tail, springs and legs, Plastic body & feet.